Zeochem Z4-01 molecular sieves combine a rugged beaded construction with superior mechanical properties to handle the severe operating conditions posed by natural gas dehydration over thousands of cycles. Zeochem Z4-01 provides more particle surface area per unit volume, higher bed crush strength and better flow distribution than the typical product available today. Zeochem Z4-01 also provides superior drying performance for hydrocarbon gases and liquids, air, inert gases, and solvents. Zeochem Z4-01's bed crush data is the best in this industry, Like most inorganic materials, adsorbents are much stronger under compressive forces compared to tensile forces. The spherical shape of Zeochem Z4-01 ensures all physical forces that impinge on it are compressive forces, resulting in lower pressure drop and longer life for the sieve. 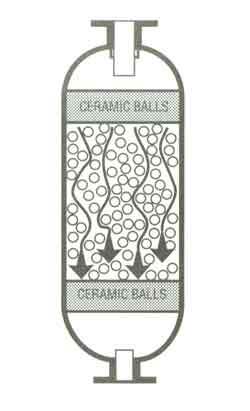 Zeochem's proprietary manufacturing process also minimizes the internal stresses within the particle itself. Zeochem Z4-01 can withstand extreme temperature and pressure fluctuations during regeneration over thousands of cycles. Results show low particle breakup and a long life over a wide range of operating conditions. Zeochem Z4-01's spherical shape and controlled size distribution gives even packing, better flow distribution and superior mass transfer characteristics over a wide range of operating conditions. In natural gas dehydration, pressure drop stability is even more noticeable over thousands of operating cycles due to minimal product breakup and superior attrition resistance. The spherical shape and smoothness of Zeochem Z4-01 provides for lower pressure drop than other adsorbents. This allows for lower compression costs, greater throughput and/or greater liquid recovery. Zeochem Z4-01, with its high packing density, provides more adsorption capacity per cubic foot of packed bed. You gain from reduced operating costs due to higher throughput or longer adsorption cycles. More surface area per unit volume of packed bed permits excellent mass transfer. An open macropore structure also enhances mass transfer efficiency. These characteristics increase the overall bed capacity to remove water. Zeochem can evaluate each situation and make design and operating recommendations specific to each plant's needs. Engineering services available to our customers include process simulation capabilities, on-site trouble shooting, and optimization and training programs. ZEOCHEM®, 1600 West Hill Street, Louisville, KY 40210. Tel: 502-634-7600; Fax: 502-634-8133.